Joshua Mullen, CPO is a certified Prothetist Orthotist with the American Board of Certification in O&P and is the owner of Empire Orthopedic Laboratories. He and the staff of Empire fabricate and provide custom orthopedic bracing and prosthetic limbs to patients at their Yorkville office. They also coordinate with area hospitals and nursing homes to provide off site care to patients in other facilities. As a child, Josh received his prosthetic limbs from Empire and worked as a technician for the company after completing his undergraduate education at Hartwick College. Josh earned his post graduate training in Prosthetics and Orthotics at Newington Certificate Program, Newington, CT. After working in the field for ten years, Josh purchased Empire Orthopedic Laboratories in Yorkville. Josh and his staff at Empire strive to provide high quality devices to patients in a positive caring atmosphere. Josh has taken advantage of a number of opportunities to provide prosthetic care to patients in need locally and internationally, including traveling to Ibarra, Ecuador to contribute to the Prosthetics for Life Foundation clinic, as well as coordinating with the Barr Foundation to provide prosthetic care here in the United States to a patient from India. 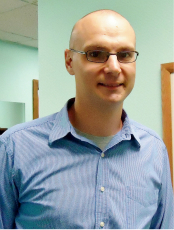 Josh resides in Rome, NY with his wife and three children. He is an avid outdoorsman and enjoys hunting and fishing. He is a runner who participates in the annual Utica Boilermaker road race and volunteers at his church, the Rome Christian Center. ©2019 Empire Orthopedic Labs, all rights reserved. 44 Oriskany Blvd., Yorkville, NY 13495.